Whether you're looking for inspiration or planning your trip - we think this will help. Here are our very favourite things to do in Buenos Aires! Buenos Aires is not a city of tourist attractions or must-see sights. In fact, ask most people what their favourite thing to do was, and they'll probably answer: simply walk around. You see, Argentina's capital is a city for your inner flâneur. One does not need to rush from site to site in the quest for iconic photos or tourist tat; to wander through its uniquely beautiful streets or sit at a pavement side coffee shop and simply watch, is to gain the greatest understanding and experience of what makes this place so incredible. So, instead of a list of important museums, central plazas or galleries of modern art, in this article you will find a few things that made us smile (and perhaps a little fatter) and turned Buenos Aires into a city we know we will return to one day. After months in South America, it's become pretty clear that empanadas are big business - and nowhere more so than in Buenos Aires. Whilst we've both developed firm favourites throughout the continent, we both agree that those on offer at La Cocina are spectacular! After reading about it on so many lists about where to find the best empanadas in the city, you've no idea how thrilled we were to find out it was just down the street from our apartment. Served from a tiny restaurant with yellowed newspaper clippings and memorabilia of an age gone by, this famous empanaderia in Recoleta looks far older than its 30 years. Unlike many empanada places we've encountered, La Cocina has multiple vegetarian options in addition to some great meat filled choices. Our particular favourites were carne picante (spicy meat) and picachu (three cheeses, onion and hot sauce) but all that we sampled were excellent. Cost: Each empanada is A$30 (updated November 2017) with a large glass of wine costing A$16 or a bottle of beer for around A$70. Opening times: These were never entirely clear, as they seem to shut up when they run out of empanadas. Get there before 3 p.m. however, and you should be guaranteed a delicious afternoon snack! In a country where 37% of the population are of Italian heritage it shouldn't come as a great surprise that you can find some AMAZING pizza in BA. However, ask any local where you can find 'the best' pizza in town and Pizzeria Güerrin will almost certainly come up. Founded in 1932 by Italian poet Franco Malvezzi, they have since made 25 million pizzas! With its red and white tiles, fading pictures of celebrity diners lining the walls and a loyal after-work crowd sharing slices of pizza and half pints of beer, the place oozes character. They have a whole host of toppings available but the most popular by far is the most traditional - thick doughy bases topped with rich tomato sauce and decadent portions of excellent mozzerella. We opted to add chargrilled red peppers and fat green olives. Sound good? It was. So good in fact that we went back. Twice. Cost: You have the choice to eat standing up, meaning cheaper slices at around A$20 depending on the toppings, or to sit in at their restaurant where a large pizza will cost between A$180 - A$240. As tumblers of good wine are the cheapest drink option on the menu, it would be rude to go for anything else, no? Opening times: 11 a.m. - 2 a.m.
Held every Sunday, the San Telmo Market breathes life into all but the most quiet of the neighbourhood's streets. Every kerbside becomes a stall selling everything from antiques and vintage nik-naks to bespoke jewellery and clothing. Not got the budget to shop? It really doesn't matter. We spent hours just people watching, chatting with vendors and wishing we had bigger backpacks to fill! Opening times: Every Sunday 10 a.m. - 5 p.m.
Legend has it that tango was born in Boca. Sure, it's touristy, but on a sunny day there are far worse places to sit with a beer and enjoy a free tango show. How to get there: From San Telmo take the number 29 bus. Get off when you see brightly coloured streets and lots of tourists. Like its counterpart in New York, Soho Palermo is the centre of cool in the city. Huddled together on the neighbourhood's wide streets you will find boutique clothes stores, coffee shops, digital co-working venues, and some of the best nightlife Buenos Aires has to offer. It seems that even if you can't afford to live in this little hipster bubble, you'll still spend plenty of time (and money) enjoying it. As you'd expect, this is not the cheapest area of town. However, for the price of a coffee and a borrowed newspaper, you can take a seat on one of the many 'distressed' wooden chairs proffered by the chicest of bars and watch the perfectly coiffed pass you by. There is a huge amount of excellent street art in this area of the city, many works of which you will inevitably pass simply while out and about. For those with more than a passing interest however, consider taking a small group street art tour. Click here to discover more. You may have noticed that a lot of the great things in BA revolve around food - so why would we stop at just coffee, pizza and empanadas? For those with even a passing interest in pastries, you simply must visit Confiteria La Pasta Frola. Opened in in 1910, it moved Avenida Corrientes in 1932, from where they have been making unbelievable decadent Italian deserts for nearly a century. Whilst they have a number of sweet treats on the menu, if you can only try one thing, make it a cannoli - we promise, you won't regret it! Address: Av. Corrientes 1365 (opposite Pizza Güerrin). 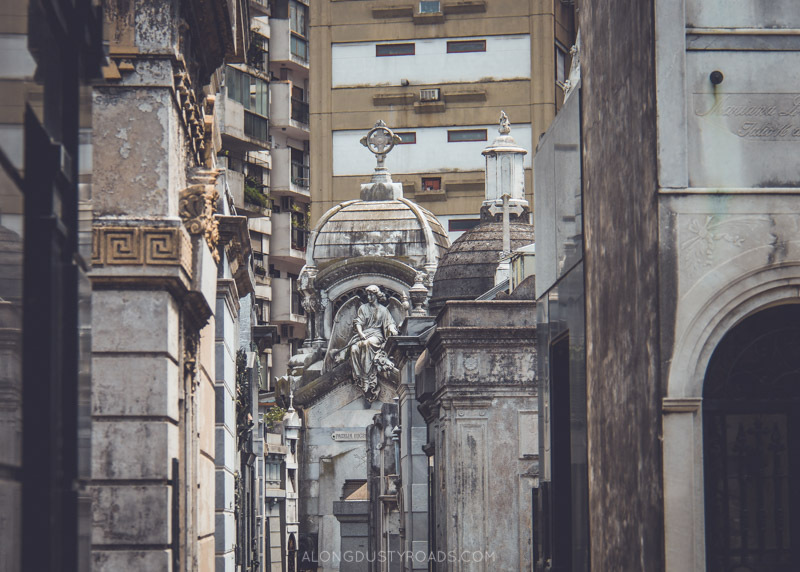 Opening times: Mon to Sat 7 a.m. - 8 p.m.
For us, there really were very few must-see tourist attractions in Buenos Aires, but one that undoubtedly makes it onto everyone's itinerary is La Recoleta Cemetery. Home to the grave of the country's darling, Eva Peron, it is where you can find the final resting place of many a famous porteño. Read any guidebook, blog article or tourist pamphlet and you may expect to be blown away by Recoleta. And, whilst the craftmanship throughout is truly quite magnificent and many a tomb beautiful, we were certainly a little underwhelmed by our visit. Cost: Free although it is possible to hire a tour guide at the gates (or take a walking tour). Maps showing the locations of the most famous sites are also available for purchase. Opening times: Open everyday from 7 a.m. - 5.30 p.m. This plaza and the boulevard which leads to it, Avenida de Mayo, are iconic in Argentine literature and political history. For a plaza flanked by so many important government buildings, it may come as a surprise that the square is a site of such permanent political protest. 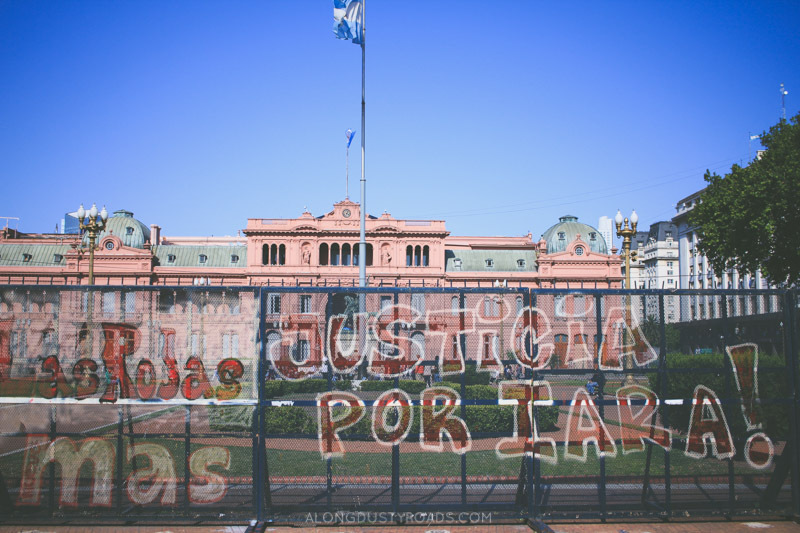 In front of the Casa Rosada - the President's official office - flags and banners often hang about one issue or another. In addition to the graphic artwork depicting the Falklands War, animal rights literature and arresting photography, this important tourist attraction has also been home to The Mother's of Plaza de Mayo since the late 1970s who continue to this day to protest on behalf of the disappeared of Argentina's Dirty War. Bookshops in Latin America have thus far been sterile and uninspiring affairs, with their cellophane wrapped books neither inviting nor engaging for more than a few minutes; El Ateneo was therefore a fantastic find. Located on the chaotically busy shopping street Avenida Santa Fe, you can escape the crowds into a wonderful space of refined calm and beauty. Converted from a beautiful theatre in 2007, it has retained many of its original features, including a stage now housing a coffee shop and boxes converted into cosy nooks to peruse your a book at leisure. It was even voted one of the top ten most beautiful bookshops in the wold, so add it to the itinerary. Opening times: 9 a.m. - 10 p.m. Mon to Thurs, 9 a.m. - 12 a.m. Fri and Sat, 12 p.m. - 9 p.m. Sun. It would be scandalous to come to the capital of tango, and not see at least a little of the famous dance. Unfortunately for those on a budget, the big tango shows are not cheap, but for those with a little beer money and a handful of tips you can still enjoy a dance or two in Plaza Dorrego. Every afternoon (and especially on Sunday) couples will dance for tips in the square, bordered by tables and waiting staff happy to bring ice-cold drinks, bottles of wine, coffees or food to you whilst you enjoy the show. Cost: A litre of beer from one of the bars/restaurants will cost around A$70 and we tipped up to A$10 per couple (feel free to give what you can afford, but we would have felt very uncomfortable giving nothing). Opening times: Dancers begin performing around 3 p.m.
Further information: If you'd prefer to attend a theatre-based tango show, this tour at Cafe de los Angelitos comes highly recommended, with the price including a three-course meal and a live tango show. After scouring the internet for cheap hostels in this relatively expensive city, one of us had the bright idea to check on Airbnb - and we were delighted that we could rent an entire apartment in a great area for less than it cost to stay in a hostel double (new to Airbnb? Sign up with this link to receive £25/$40 off your first booking). Should you prefer a hostel vibe or you're travelling on your own, there are literally dozens of places to choose from. The two top rated options in town are America del Sur (previously voted Buenos Aires' best hostel) and Milhouse Hostel Hipo. For a full list of hotels in the city, see this link. A city with a metro is always much easier to negotiate than one without and Buenos Aires is no different. Whilst there are plenty of buses that can ferry you between destinations in the city, they are notoriously difficult to negotiate, and we found that almost exclusively using the underground plus our two legs was enough to reach almost every place we wanted to visit (with the exception of Lo Boca). To use the metro, you have two options. Either pay as you go, with each journey costing A$7.5 or buy a SUBE card (with either you have an unlimited number of transfers). Having lived in London for years, the home of the Oyster card, the logical thing for us was to buy a SUBE card. However, given that the card costs A$35 before you even put any credit on it, and that the discounted fare isn't actually that great, unless you're in BA for a considerable time, it's really not worth it. For up to date information on Buenos Aires' extensive transport network, see this English-language site.